When your CASCON software reports issues with your hardkey (dongle) license, you can collect details about the issue using the HL-Upgrade tool and send these details to GOEPEL for analysis. This will allow us to better assist you in getting the license working again. Any screenshots you can send and explanations of what you are seeing would be helpful, too. Open the HL-Upgrade tool ("Update for Hardkeys" in the CASCON Program group under the Windows START menu). Select the "Collect Update Information (CTV)" tab, choose Information "to file" and enter a file name if it is not predefined (browse to a specific location, such as the desktop, to find the file easily after creation). Click the "Collect Update Information" button and then send the created CTV file to your GOEPEL support representative, together with any details you have about the issue you are encountering. 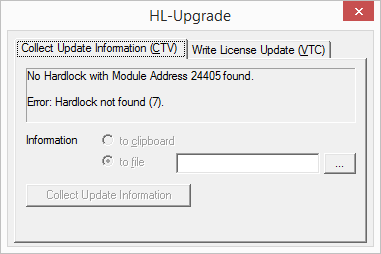 In case your hardlock is connected to the PC but is not found by the software, the HL-Upgrade window will display an error message and collecting details will not be possible. The hardkey (dongle) may be destroyed beyond repair, the USB port on the PC may not function properly, or the hardkey may not be inserted properly. Double-check that the red LED on the hardkey is lit.